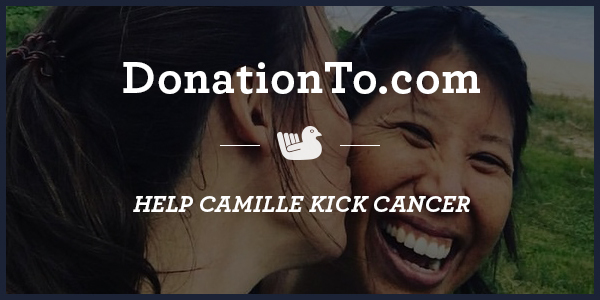 Camille Kick Cancer Campaign Saved Over $350 Using DonationTo.com Paid Accounts. No 5% Free! After Camille was diagnosed with stage II breast cancer, she went through all of the typical treatments such as radiation, chemotherapy and surgery. This was successful, but it did not prevent the later development of stage IV cancer in her spine, hip and pelvis. However, Camille is committed to fighting this battle, and she and her partner have made the decision to take a more holistic approach moving forward. The DonationTo online medical fundraising platform makes it possible for people in Camille’s position to reach out for support from people around the world. Our nominal monthly fee starts at a mere $9, and this represents a large savings versus fundraising pages that claim to be free. In fact, the average per transaction fee for a free fundraiser is 5 percent. To date, $7,160 has been raised in two months. With our paid accounts, the absolute most this could cost is $48. Meanwhile, a so-called free account would have already racked up $358 in fees. As you can see, it definitely makes sense to pay close attention to fee structures before choosing an online crowdfunding website. Because of the decision that was made by Camille’s friend, Kristin, more than $300 was saved on fees and can now be used to help her fight against cancer. To take a firm stand against this latest round of cancer, Camille is dedicated to getting traditional treatments. At the same time, she is going to take a holistic approach in the hope that this will make a noticeable difference. Camille’s plans include adopting a vegan diet, receiving naturopathic treatment and taking daily supplements. As a result, Camille’s current battle with cancer will be more expensive than the last one. This is often necessary due to the fact that even the best insurance does not cover everything. However, in this particular situation, all of the holistic options that Camille is planning to add to her treatment must be paid for out-of-pocket. Therefore, medical crowdfunding is the best way to reduce her financial stress and enable her to focus on getting better. Spine cancer can cause a long list of medical issues, including difficulty walking, muscle weakness, loss of sensation and back pain. It is unknown what causes this type of cancer, but people who have previously had breast cancer have a much higher risk of developing a tumor on their spine. According to the American Cancer Society, 23,770 spinal tumors will be found this year, and more than half of these patients will end up losing their fight against cancer. On the plus side, the overall odds of someone contracting this disease are less than 1 percent. The rarity of this particular cancer helps protect people from it, but it can also cause a lack of awareness that leads to unnecessary deaths. If you or a loved one are experiencing back pain along with sudden and unexplained sensory issues, numbness or tingling in the legs or arms, loss of bladder and bowel control and difficulty walking, it is imperative to go to your doctor. Keep in mind that early cases of spinal cancer may not include all of these symptoms, so anything from the list in combination with lower back pain should be taken very seriously. Camille’s fight to survive has caused her to seek assistance out-of-state, which puts an even larger financial strain on her and her partner. Fortunately, an outpouring of support and contributions will help them take the necessary steps to keep Camille as healthy as possible. Studies have found that emotional support can make a huge difference in a cancer patient’s long-term survival rate. Due to this, DonationTo has provided a comments section on each of our fundraising pages so that friends and family can leave some kind words along with their donation. Camille has a long road ahead of her, but the emotional and financial support of her family and friends will help her in her latest cancer battle. DonationTo is proud to offer a platform that makes it easier for Camille to get the help she needs, along with serving as a centralized online location for everyone to remain updated on her process. By using our crowdfunding website and a paid account, Camille and her partner are able to save a lot of money versus a so-called free account. Our partnership with WePay and PayPal also simplifies the process of collecting and process online payments. As an added bonus, our fundraising structure enables Camille to have access to each donation in real time. Additionally, we offer phone support to answer any questions. With 217 days left and less than $3,000 to go, it is highly likely that this campaign will not only meet but exceed its goal.